There are still places on the six day course during the Festival to make a 23 string lap harp under the guidance of Breton harp master Sylvestre Charbin. The course runs from October 25th to 30th, and the deadline for applications has now been extended indefinitely. It takes place in the beautiful and serene setting of Quarr Abbey, just outside Ryde. 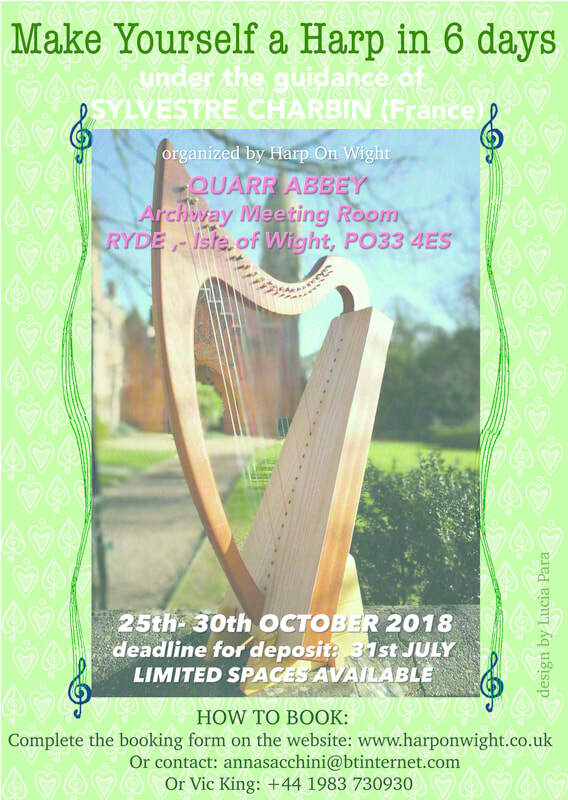 HARP ON WIGHT run a mixture of different courses, from harp making, beginner learning to advanced masterclasses throughout the festival. PROCEDURE: Students are required to adjust and glue together different parts of the instrument following the drawing plan. It is not just a kit: students will have to cut some parts of wood to the right size and fit the different pieces together, using a plan to work on the soundboard and adjust the response of the instrument. Students can shape their instrument a they wish with a degree of freedom to personalize it. They will then learn how to draw the instrument, how it works, what to do with the wood, which woods are preferable and why, how the shape and thickness and quality of the wood affect the sound of the instrument, how the sound changes if the design is modified, to understand the mechanical forces that affect the instrument, etc…. OBJECTIVES: The purpose of this workshop is not just to build your own harp. It will also give you an insight into instrument making. By the end of the course, in addition to the harp you have made, you should have a thorough understanding of the relationship between the design of the instrument and the sound it produces. With this knowledge you will never look at a harp again in the same way. This course provides an excellent starting point for those wishing to take their harp playing to a professional level. DEPOSIT: A £ 350 DEPOSIT MUST BE PAID WHEN BOOKING. Places will be allocated on receipt of deposit. Payment of deposit by 31st July 2018 will enable the luthier to prepare the parts ready for when you attend the workshop in October. The final payment of £ 350 must be made by 15th October. CLASS: The course can accommodate a maximum of 6 adults, aged 18 or over. Intending participants must ensure that they can attend for all 6 days in order to complete the harp. Only one instrument per participant is to be made during the course. For health and safety reasons It is not possible to have children in the workrooms. HOW TO BOOK: Complete the Booking Form available on the website: www.harponwight.co.uk or contact annasacchini@btinternet.com or telephone Vic King 44(0)1983 730930. Sylvestre Charbin was born in 1971. He is a self-taught musician and from an early age he loved to work with wood. After completing his formal education with a Master’s degree in cell biology at the University of Rennes, he returned to his first love and in the 1990s began to make musical instruments, developing his particular interest at that time in the making of flutes. Sylvestre joined the CPFI (Centre du Patrimoine de la Facture Instrumentale) in 1999. CPFI is an organization set up to collect music, musical instruments and musical know-how from artists world-wide, and share these with other artists and the wider public. The Centre has a collection of 3,000 instruments from many different countries, which are played and exhibited and in constant need of care. Sylvestre was responsible for their care and repair until the end of 2016, when he set up his own harp making company.